Geoff Duke flat out past the straw bales at Bandiana. Imagine if Valentino Rossi decided to spend the European winter earning a bit of pocket money by taking in a series of races in Australia with his works state-of-the art Yamaha Moto GP weapon. A parallel scenario actually happened 54 years ago, when reigning 500 World Champion, the dashing 31-year-old Geoff Duke, arrived on our shores with two works 500 Gilera fours. To put things in perspective, Duke was the first motorcycle racer to become a post-war media megastar. Handsome and erudite, Duke was also blessed of phenomenal talent on two wheels. Ever since he turned heads by winning the 1949 Senior Clubmans TT on the Isle of Man, his rise to stardom was meteoric. With the superb handling but underpowered works Norton singles, he took the fight to the European opposition, notably the multi-cylinder MV and Gilera fours. After gathering the 1951 500 title for Norton, he defected to Gilera in 1953 and set about instilling British handling into the already rapid package. The result was a near-invincible combination. 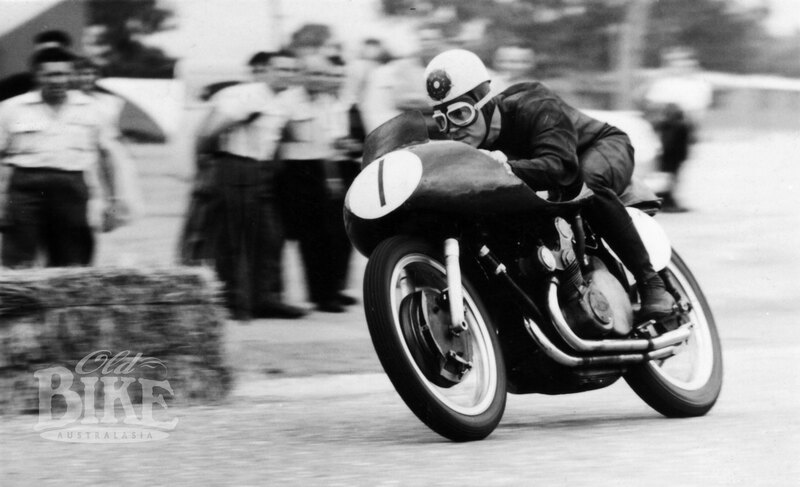 Aboard the Gilera, he won 9 GPs in 1953 and 54 to take back-to-back titles. Late in 1954, rumours of a Down Under tour by Duke, as well as our home-grown star Ken Kavanagh, and Rhodesian tearaway Ray Amm, began to circulate. Then Amm was injured in England, and Kavanagh withdrew for personal reasons, leaving Duke on his own. George Lynn, editor of the Australian Motorcycle News paper, had been handling Duke’s arrangements and convinced him to still undertake the tour, despite the lack of travelling partners. Eyeing a possible export market, Gilera gave their blessing and two 500s were shipped from Genoa, accompanied by works mechanic Giovanni Fumagalli. The bikes arrived in Fremantle on January 2nd, 1955, and after some wrangling with local customs officials (who placed a value of $40 each on the priceless machines), the cargo was cleared. Duke travelled by air, arriving in Sydney on Friday 7th January to be greeted by a bevy of fans and riders, before flying on to Perth where he was deluged by the media. In the mid-fifties, the closest that Australian motorcycle enthusiasts came to ‘the big time’ was via months-old copies of the English weekly magazines, The Motor Cycle and Motorcycling, so the appearance of a world champion was greeted with near hysteria. 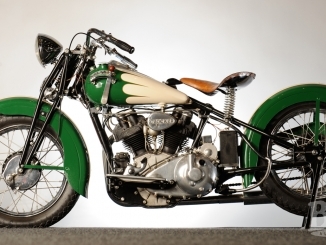 In Perth the Gileras were entrusted to Harry Gibson, former land speed record holder on a Vincent. After a day of interviews and personal appearances, Duke was whisked off to Mooliabeenie, a wartime airstrip 60 kilometres from Perth that could be accessed only by a rough bush track. For a rider accustomed to the classic circuits of Europe, the sight of the crumbling strip was somewhat sobering. Race day, January 16th dawned stinking hot, but it did not deter 15,000 eager spectators from filing into the circuit. With the temperature soaring to 45 degrees, members of the organising clubs, the Ariel, BSA and Coastal MCCs, formed a human chain to sweep the track surface free of loose gravel before racing could start. Practice had shown that Duke’s main opposition would come from local all-rounder and current Australian scrambles champion Peter Nichol, on a Matchless G45 twin, and from George Scott’s GP Triumph. The start of the first race was eventful, with Nichol crashing heavily on the run to the first corner and badly damaging his Matchless. Scott held second before his machine jammed in third gear, allowing Jack Lowe’s Norton through into second behind the long-gone Gilera. Scott had the gearbox functioning again for the Unlimited race and clung to Duke for the entire race. In the latter stages, a stone flung from the rear wheel of a lapped rider smashed one lens of Duke’s goggles, cutting his face and further adding to his discomfort. However he maintained his advantage to the flag, holding a slight advantage over Scott. Adelaide was the next port of call, but with a total ban on public roads racing still in force by an Act of Parliament, the only suitable venue to be found was Gawler airstrip. Even obtaining the use of this rugged site was difficult, and only the intervention of the directors of the Adelaide Children’s Hospital (the charity which would benefit from the meeting’s proceeds) saw permission granted for its use. Even so, as Gawler was officially an emergency site in case of bad weather for the main Adelaide airport, a proviso was that aircraft still had right of way! But again, race day turned out to be a scorcher, with the hot gusty winds blowing dust and dirt in all directions. With 16,000 spectators crammed into the confines of the airstrip, it took some time to erect extra barriers for crowd control, meaning that practice was restricted to four laps. Duke found the Gilera wheel-spinning in top gear down the gravel-strewn straight, and was rather unimpressed with the whole set up. In the 500cc race, Keith Campbell had the crowd jumping for joy as he took the early lead. Although the Gilera clearly had the speed, Duke had his hands full with Roger Barker, who would constantly slide under the maestro on the slippery corners. With the air full of dust, Duke’s Gilera ingested a gritty mixture, knocking a few hundred revs off the top end, and he had only managed to catch Campbell as the race reached its final stages. The Victorian was far from beaten, but just when a thrilling finish was looming, the gear lever of his Norton dropped off and he was out. The heat was so intense that both Campbell and Barker needed medical attention and were unable to start in the Unlimited event. Duke also declined to start. His number one machine was off song after its diet of Gawler grit, and he was unwilling to use his spare Gilera (the bike used in the World Championships by Irish star Reg Armstrong) so early into his tour. His decision caused much consternation amongst officials, but Duke was adamant. In the end, just six riders took the start for the Unlimited. After the rugged confines of the first two venues, Bandiana army camp near Albury was a welcome relief for the meeting on Sunday January 30th. A 4.5 kilometre layout through the camp featured well sealed roads, but the back straight incorporated a jump over cross roads that flung the Gilera into the air at somewhere around 200 km/h. Duke’s day began badly when the Gilera stopped on the far side of the circuit after only a handful of practice laps, giving him a long push back to the pits. It transpired that the magneto armature had lunched itself, and the machine was whisked back to local star Doug Fugger’s workshop in Albury for emergency repairs. A 1955 Bandiana programme signed by Geoff Duke. With its sparks returned, the Gilera arrived back at the circuit with practice finished and the support events under way. Young Eric Hinton, riding a highly-modified road-going 500 International Norton, won the Senior Clubmen’s event, making sure to do it in the slowest possible time. The reason for this ploy was that handicaps were being calculated for the final Feature race on the results of the scratch races. 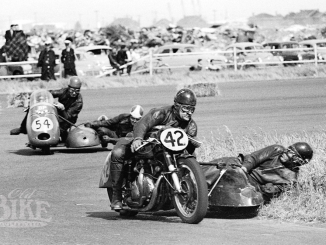 In the 500cc Senior race, Duke settled in behind Maurie Quincey’s Norton for several laps to learn the line, then opened the taps and cleared out to win easily by 25 seconds – a fact not unnoticed by the handicappers. With daylight fading, the Unlimited Handicap was reduced to six laps, and Duke conceded 45 seconds to Eric Hinton, and 25 to Eric’s father Harry, riding an ex-works 350 Norton after crashing his 500 in the Senior. Finally Duke was away and set about carving through the field, blasting by rider after rider as if they were standing still and shattering the lap record. With just one lap to go, only one rider lay between Duke and the chequered flag, but even his final record-smashing circuit could not bridge the gap, and Hinton took the win by just 30 metres. It was to be the only time Duke was beaten during his stay. The Gileras were to be next domiciled in Sydney, in the garage of our family home in Hurstville, and were loaded onto a box trailer towed behind my father Charlie’s Holden FJ utility for trek back from Bandiana. For two whipper snappers, myself and my younger brother Peter, the rugged confines of the back of the utility amongst all the gear gave us a fine view of the priceless cargo during the trip, with the cabin seats occupied by my mother June and works mechanic Giovanni Fumagalli. Geoff Duke displays his immaculate style at Mount Druitt. Geoff Duke after his victory at Mount Druitt, with Keith Stewart on his Matchless G45 behind. Duke’s next racing engagement was two weeks later at Mount Druitt, west of Sydney, but before this there was a whirlwind round of other duties. 1,300 enthusiasts crammed into the lower auditorium of Sydney Town Hall , with many more forced to listen from outside in Druitt Street. The audience hung on the champion’s every word as he recounted tales from the European theatre, while diplomatically avoiding any criticism of the local scene. He did, however make the point that he did not support the local alcohol-fuel formula, claiming that the superior performance it created was overshadowed by chronic unreliability. The following day, accompanied by several members of the Auto Cycle Union of NSW, he was flown to Bathurst to inspect the nation’s pride, the 6 kilometre Mount Panorama Circuit. The ACU, and Bathurst Council, held faint hopes that Duke could be persuaded to ride at the NSW TT at Easter, and Bathurst’s Mayor was among a string of identities who greeted him as he stepped onto the tarmac at Bathurst Airport. Duke was lavish in his praise, describing the track as “set in beautiful surroundings…with a wide variety of medium, fast and slowish bends, and probably more gradient in 1.5 miles than I have ever seen. I was indeed sorry that the necessity for returning to Italy, to test machines for the coming season, prevented me from competing at the Easter meeting”. Not half as sorry as the ACU! Again, a bumper crowd poured into the scruffy Mount Druitt circuit to see the world’s top rider in action, and this time the weather was much more benign. The track surface, basic at the best of times, was in extremely poor shape due to the number of car races in recent months, but Duke praised the general layout. To the delight of the crowd, evergreen Art Senior, on his home-brewed Ariel-based special, shot into a brief lead in the Senior GP. Before the first lap was completed however, it was the blood-red Gilera out in front, running away to an easy win. Riding the race of his life, Keith Stewart brought his new Matchless G45 twin home in second place, ahead of Harry Hinton. Everyone expected big things from wild man Jack Ehret, the lap record holder, in the Unlimited race. But Ehret’s alcohol-burning 1000cc Vincent Black Lightning was slow to fire from the push start, whereas Duke was quickly in the saddle and disappearing. Although unable to bridge the gap, Ehret charged through the field, sharing a new lap record with Duke. As some consolation, Ehret then fitted a ‘chair’ to the Vincent and won the Sidecar TT! One week later, it was back to Victoria for a combined car and motorcycle meeting at the airstrip at Fisherman’s Bend in the heart of Melbourne. With his number one machine now getting rather tired, Duke switched to his spare, but found it severely lacking in bottom end power. The featureless layout, with long straights and hairpin turns with hay bales on the inside, presented its own obstacles. Noel Cheney, who rode at the meeting recalls, “We (the local riders on Nortons) used to brake hard and hug the straw bales tight on the corners, which meant we had to slip the clutch hard, and this resulted in a lot of clutch problems. Duke, however, would brake out wide, then swoop in and just clip the bales coming out. We all hoped that no-one would outbrake themselves and torpedo him.” On his home turf, Maurie Quincey was in fighting form, and led the 500 race until clutch slip set in. By this time Duke had stalked his prey and pounced when Quincey ran wide at a hairpin bend. In the Unlimited event, Quincey again took the early lead until the clutch gave out completely, leaving Duke to win easily from Doug Fugger’s Norton. With a week to spare before his final engagement at Longford, Tasmania, Duke could have been expected to relax with a spot of sight seeing, but he chose to compete in a local scramble at Springvale, where he rode a pre-war 250 Empire Star BSA, provided by Jimmy Guilfloyle, complete with rigid frame and girder forks! Qualifying through a heat and a semi-final, he lined up for the 250 Final with nine others, his hands now red-raw from the pounding. Alas, while holding fifth place, the ancient engine cried enough. The Longford meeting was to be held over two days, Saturday and Monday, and in the opening race Duke was circulating comfortably in front after passing first lap leader Noel Cheney when the engine began to lose power. Sensing his chance for glory, local star Max Stevens, on his ex-Ken Kavanagh Norton, really got his head down and closed to within a few seconds of the ailing Gilera when the chequered flag came out. The Gilera was rushed back to Launceston , where a faulty magneto was diagnosed. 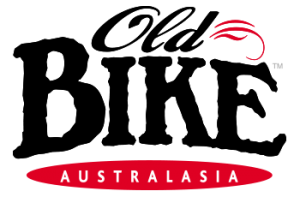 With the unit beyond repair, a frantic phone call to Melbourne, where the other Gilera was already packed ready for shipment back to Italy, had the magneto removed and on a plane to Tasmania, where it arrived late on Sunday afternoon. With the motor now sparking healthily, Duke had no problems in winning the Unlimited race, with a new lap record of 152 kph/h, before jumping out of his leathers and rushing to the airport to catch his flight to Melbourne. His whirlwind tour had taken him to every state except Queensland, and his charming and eloquent manner did incalculable good for motorcycling. The unprecedented publicity generated helped to dispel the popularly-held, media-fuelled belief that motorcycle racers were a bunch of half-wits with a death wish. It also had a profound effect on the local riders, serving as a stark reminder of the gap between our rather primitive scene and the European big time. A number of our up and coming stars impressed him, including Keith Campbell, Roger Barker, and particularly Bob Brown, who had just gained selection as Australian representative to the 1955 Isle of Man TT races. “This young man is a joy to watch, uses his head, and should figure very well in the IoM and on the Continent,” he said in his report to the British press. When Duke was injured at the start of the 1957 season, he recommended Brown to take his place in the Gilera team for the TT, resulting in two excellent third places. For 1958, Duke personally sponsored Bob on a pair of Nortons. There was considerable speculation of a return trip Down Under after the 1955 European season, but by that stage Duke, Reg Armstrong and 12 other riders, many of them leading privateers, were under threat of suspension following the infamous ‘Riders’ strike’ at the Dutch TT. Nevertheless, the sight, and sound of the maestro on the screaming red ‘Fire Engines’ stayed with everyone who witnessed the spectacle for many, many years.